Outdoor cinema is about the surroundings as much as about the actual event. Find the best possible landscape or landmark, and bring outdoor cinema there to create unique experience for your guests. Carved by Mother Nature Red Rocks Amphitheatre is a spectacular place near Denver, Colorado. It is used both for outdoor cinema and concerts, and has a capacity for over 9500 people. Barcelona’s Montjuïc Castle is a gorgeous backdrop for a movie screen. The ancient walls create both feeling of protection and connection of epochs. 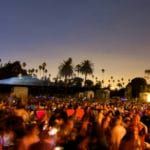 Hollywood Forever Cemetery outdoor movies use the big grassy field against a gorgeous Hollywood landmark to charm their audience. 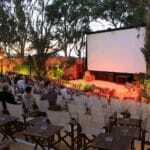 St George Open Air Cinema in Sydney offers majestic views over Sydney Harbor. Cinekamari movie theatre on the Greek island Santorini became part of the cityscape. Six Senses Yao Noi resort in Thailand offers guests outdoor cinema floating on the water. And the photo of the movie screen against the cliffs is quickly becoming an iconic one. Look around and find the landmark which will give that special feeling to your outdoor cinema. Think about streets and rooftops, waterfronts and mountains, old warehouses or even carparks, or simply choose the nearest park with the views. Having a Facebook page is not enough. Do your customers go to your Facebook page to check if tonight’s show is cancelled due to the bad weather? Great beginning, but is not enough either. Know your audience and use your unique voice talking to them. Use your social media channels to create the mood of your supporters, to share with them the memories of a good evening, to intrigue and to engage them. Backyard Cinemas of UK talk to their friends, using their everyday language and emoticons. You could tell they are young and energetic; they are about good music, alternative cinema and good fun. Their “about us” video is also full on! The Galileo Open Air Cinema in South Africa constantly engages their audience, asking for advice, offering prizes, involving local businesses. They also publish a lot of photos of cinema goes. We at Smart Digital do not organise events, but we are on Facebook to inspire you to bring outdoor cinema to your community. Here we share tips and tricks on how to organise fantastic movie nights. 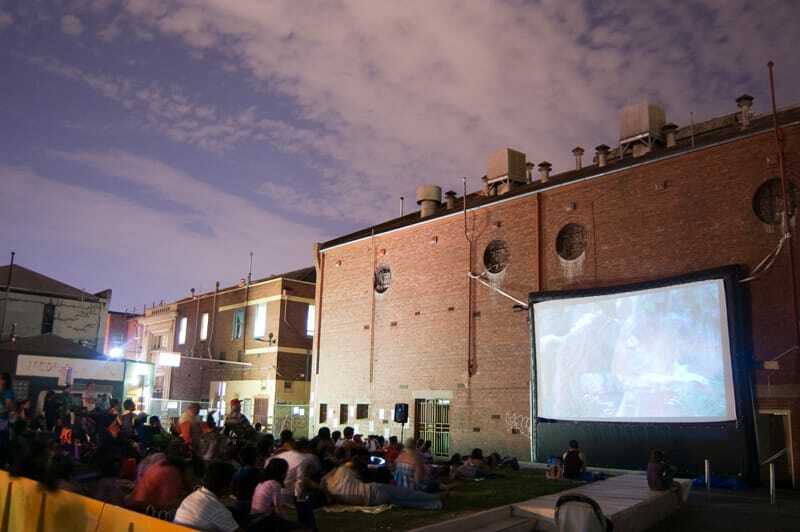 We help you select films and tell you about outdoor cinemas around the World. And we help you bring more magic, more fun, and more entertainment to your backyard. Outdoor cinema is so much more than just watching a movie. It is great experience, and the more senses are engaged, the better. Combine good food with good movie. Like matching food and wine, matching food and movie is a fine art. Family movies do not go well with wine and a plate of gourmet cheeses. 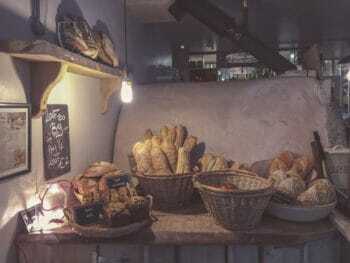 Arthouse will loose it’s aroma paired with burgers. Get your inspiration from Melbourne’s Gourmet Cinema, who matched local restaurants with the movies. They challenged the chefs to complement the movie with the equivalent cuisine. Revive good old drive-in experience, combining it with retro auto show, live band, and a fashion show. Offer entertainment before the movie. Dress ups are easy. Add themed photobooths the way Cinespia did, and absolutely awesome fun and great memories are guaranteed! Don’t forget live music – invite local bands or young talents from local schools. Think comfort. Outdoor movies in beds? Possible with Mov’in Bed event organisers. Glamping movie night? 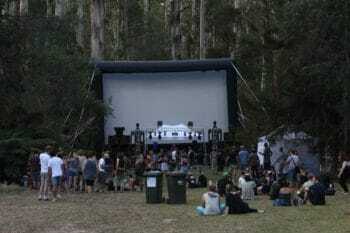 Not a problem with Sydney Hills Outdoor Cinema. The examples above tickle your tastebuds, add luxury and create excitement in the participants. They will come for more! Great night is only possible if you got your hardware right. Movie screen should first of all withstand strong winds, and also have 16:9 aspect ratio. Secure it to the ground and ensure safety of your guests. Get the right size screen for your event. Movie screen should be big enough both to wow the audience and to fit the outdoor space. It also needs to be compact enough to be portable and easy to handle. The easier it is to organise the show, the more events you’ll be able to run! Choosing the movie screen think whether you will be using rear or front projection. Small and medium inflatable movie screens often use lycra as a screen surface – but they are not created equal. Cheap screens bought on eBay can turn out to be of poor quality, too transparent to deliver bright picture. Seams and wrinkles do not improve the situation either. Select adequate speaker power. There is no point going for surround sound – there are no walls to reflect it! Yet, there should be enough grant and power in the speakers so that everybody could feel comfortable and emerged in the movie. Finally, choose bright movie projector and place it on the correct distance from the screen, so that it fills the white screening area completely. 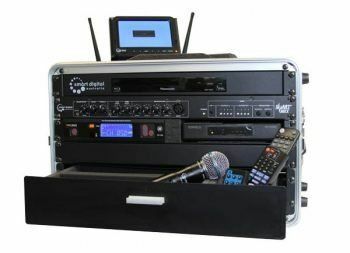 And if you want smooth and easy operation, consider investing in a proper audio video control system. Serious outdoor cinema businesses select quality equipment to provide the best viewing experience to the audience. 5. Find your USP. Be unpredictable. USP, or unique selling preposition, makes your business stand out from the crowd. Hot tub cinema, invented by Asher Charman in London, is a great example of fantastic USP. It is talked about, copied around the world, totally crazy and successful. Think about something unusual. It does not have to be commercially successful in 100% of times. Screen made of snow may not have gathered large crowds, but it has been much talked about. Winter movie nights proved to be popular in cold climates, like that in Norway. Christmas movie season was full on in London, and the cold did not hinder the audience from enjoying a good movie night. Hailing from sunny Adelaide and first run on Halloween of 2015, Horror Movie Campout is another unique event, travelling all over Australia. If your nervous system is strong enough, and you are craving some adrenaline, that’s an event not to be missed! Which movie will you show in the woods? Know your audience and be able to surprise it. Melbourne’s Underground Cinema took the concept of surprise to the highest level, keeping secret both the film title and the location of the movie session! Selection of movies will help you find your segment in the outdoor cinema business, and find your audience. Family movies are mainstream and highly popular. You won’t get it wrong showing popular cartoons and PG rated family films. Are you competing with other outdoor cinema businesses in a big city? Find your style to be heard. Show classical movies, creating atmosphere of bygone epoch. Appeal to audiophiles – organise live concerts and show films dedicated to music legends and cultural icons. Be provocative. Go for cult or underground movies, or organise thematic nights dedicated to famous movie directors. Try different ideas and don’t be afraid to fail – you’ll find successful outdoor cinema model only via trial and error! Your challenge now is to find something not yet invented! 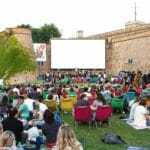 However, just combining different ideas and implementing them at high standards is enough to become one of the successful outdoor cinema businesses. Great tips, we don’t have much outdoor cinema in Israel but I’d love to see it make a come-back.